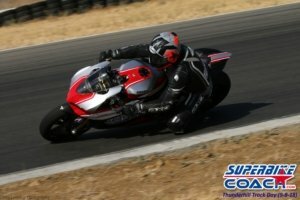 To ride a Supermoto bike on a small track is pretty much the coolest thing you possibly could do on two wheels, and we at Superbike-Coach are ready to get you into this- no matter if you are a street rider, or an experienced track rider. Coach’s intense feeling for your skills will give you the personalized lessons you need to be a better rider. He’s on you all day to add- and to correct existing skills. 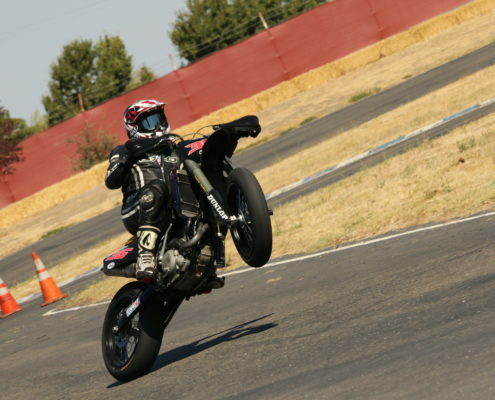 Riding a Supermoto is a total different approach, so you’ll learn specific lines- body positioning- shifting- and even backing in. You’ll get a video, taken with Can’s HD video equipment and you’re connected via Autodirect radio with him, an experienced European championship pro. This is real practical hands-on training. We also borrow you modern GPS technology, so we can analyze your Lap times, Split times, and Ideal lines via GPS (No purchase required!). If there is no Supermoto 1on1 scheduled– we work out the ‘when and where’ to go together with you, right after you’ve signed up. In case you don’t have a adequate Supermoto rental bike… we have one for you, so make sure you opt it in the booking process. If you want your coaching more personalized- this program is also available as 1on1 or for small groups. The scheduling is also individual, but during weekdays only. The coaching fee depends on headcount: 1 $279, 2 $260, 3 $240, 4 and up $220. There will be also a additional track fee which will be divided by headcount. Click here and let us know your plan to set this up. Note: Scheduling right after booking. Additional track fees may apply. We prefer Mondays or Tuesdays for the training. We can help you out. Rent our KTM520 Supermoto bike which is coming with gas, tires, and transport. The fee is $190. An optional damage protection plan of about $85 (covers you to max $700 in damage, no matter how bad it is). Of course you can bring a cheaper 3rd party rental, but you won’t have that insurance, and no transportation to our track. Just opt it in the booking process.